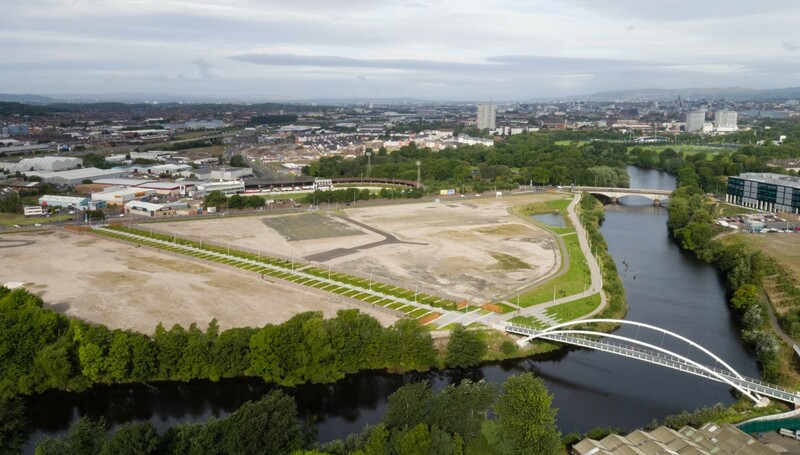 Highbridge Properties and Clyde Gateway have launched what could become one of the UK’s largest office parks on the former Shawfield development site in Glasgow. 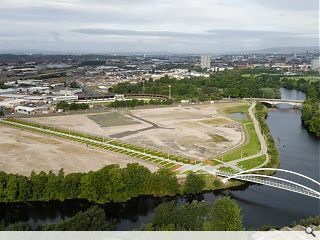 Magenta will offer 1.3m sq/ft of Grade A accommodation on 27 acres of land bounded by the River Clyde and M74 motorway and is development ready following an investment of £20m in public realm and infrastructure works. This will seek to lure businesses from the city centre by offering rental rates up to 37 per cent lower than space of a similar spec with the offer of purpose built accommodation for individual organisations to meet their exact requirements. Adrian Hill, director of Highbridge Properties said: “When I first saw this site it reminded me of London Docklands in the early years – so much potential and so close to the city centre. Magenta is a very compelling option for businesses, boasting superb connectivity, infrastructure and value for money. An architect has still to be appointed for the scheme which will include supporting services such as shops, cafes, a gym and business centre as well as headquarters office space for BRE. Is this site not in Rutherglen, South Lanarkshire? £20m of public money towards producing car dependent sprawl the conscious, stated purpose of which is to draw activity and jobs out of the city centre. Absolutely brilliant. Yup, because Rutherglen, is an isolated wilderness away. Another act of self-sabotage for Glasgow. We have Tradeston sitting opposite the CBD with oodles of space and excellent under-utilised transport linkages. If $$$ were invested there it would likely have a knock-on effect on other private investment as the area comes up. Instead, we are pumping money into an out of town office park that will encourage car use, potentially take jobs from the city centre and will be a miserable soulless sterile dump to work in. Can we not use this space for light manufacturing or something? Yeah, I don't get moving potential office users out of the city when it's not as if there's a dearth of space and gap sites. This looks like a perfect site for an "out of town" leisure development. The area is bordered by Rutherglen formerly of Glasgow and Dalmarnock Bridgeton and Oatlands ,all of Glasgow. It is handy for Dalmarnock train station and bus routes and access to the motorway at Polmadie. So not that remote and cars not essential. Walking distance to the city centre ,about a mile via Glasgow Green. So could be very attractive to potential tenants. Police Scotland already there on the opposite bank of the river. I would have preferred a new residential area there and businesses kept within the city centre and Tradeston. However there is a nice park there with a large pond which would be nice for office workers on a break. There is also an new gastro pub wanting to open up in the area as well as the continued development of Oatlands. So it has its attractions. Yeah it's on the Glasgow/Sth Lanarkshire border but it's a good spot for transport connections as well as being walking/cycling distance from town. I walk past it frequently on my way to/from city centre, have done for years and there's one problem with the site that really needs addressed... the smell from Dalmarnock treatment works. To be honest the hardest part about walking down there is trying to hold your breathe between Ruggy main St & Glasgow Green because it'd burn the lungs out you some days. Housing is planned as well,but on the Glasgow side of the bridge!